The holidays always makes one nostalgic, doesn’t it? Among the many things I’m thankful for this holiday season is my childhood, which was filled with so much adventure and good food. And they went hand-in-hand – almost literally – in this tidy little tin box that I carried to school every day from pre-school through kindergarten. Okay, maybe part of first grade too. I really can’t remember. At some point, I graduated to the paper bag, which was so much more sanitary (lunch boxes have this unmistakable “locker room banana” smell that I still can’t shake), disposable, transient, and imagination-killing. Luke, Bo, Daisy, Uncle Jesse, Boss Hogg – the whole gang – kept me company through countless colouring books, field trips, and the dreaded nap times. It was the envy of many a rambunctious classmates, and a few girls too. Thanks mom and dad – you were and still are the best! 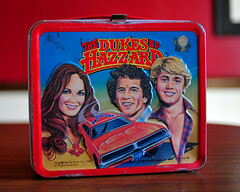 What was your first lunch box? ~ by ulterior epicure on November 28, 2009. I never needed a lunch box in elementary school because I went home for lunch except on Fridays when I went to my grandmother’s. But I think one of J’s is still on a shelf in our garage. @ Ms. Toity-Toid & Toid: Oh, but I do want to know what kind of characters J had on her box! @ u.e., When we’re back in NJ, I’ll look for it. @ ChefCG: Yeah, too bad Yoda dominated one side instead of the Princess. There was a G.I. Joe one that I coveted for a couple of years. Much to my chagrin, I graduated to the paper bag prematurely. I found J’s (very dusty) lunchbox on the shelf in the garage. Green gingham-checked background. No characters from t.v. shows or movies; instead, (and I know you are going to love this) — watermelons! On the cover and bottom. But on the cover, they are obscured by a whole bunch of stickers, each with a different animal picture and the words “Good Work.” Obviously, a diligent nursery school student. @ Ms. Toidy-Toid & Toid: Watermelons. Love it!